In recent times, teachers and learners have been teetering on the tipping point between conventional and innovative practices of how education occurs. It is in our current learning spaces that we must take the time to consider new pedagogical design practices, those which harness the possibilities of the virtual world. With the nature of the virtual world and contemporary technological development, Virtual World Pedagogy is defining and redefining itself each day. The definition stated here will most certainly evolve towards something more and that which is reflective of the virtual spaces in which it exists. In this context, therefore, VWP is theoretically grounded in three core values: communication, collaboration, and creation. These three core values will support the actions of the educator and the learner in the virtual space. It is important to understand that pedagogy, in this definition, describes the actions of the teacher as the purposeful learning designer and the facilitator of knowledge acquisition. In turn, the educator in this space would develop and design VWP as a pedagogy of the collective—not merely an educator-driven teaching practice (which may lead to conventional observatory learning) but as an active engagement and inquiry through the crafting of learning in a communal space. 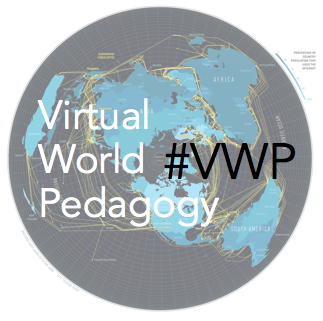 Virtual World Pedagogy is the design and use of a virtual world Web space where new learners are given opportunities to use the Internet and Web 2.0 technologies to develop their own learning within parameters set by curricula, success criteria, and/or common learning goals. Here, it is critical that the educator as designer have knowledge and be comfortable in online learning space design and delivery platforms and be confident in working with new learners in new multimodal, online, and social media spaces (Cope & Kalantzis, 2010). In these spaces, the new teacher engages with VWP as the facilitator while managing a multifaceted, differentiated, and participatory virtual learning environment for a variety of new learners who are designers of and are engaged in a variety of types of learning. These learners create their own meanings and understandings, within set parameters, through the Read/Write and Remix practices. Virtual World Pedagogical design utilizes a variety of online, Internet-based virtual worlds. Whether it be WordPress, YouTube, Twitter, or Google Apps for Education, these virtual worlds offer users the ability to communicate, collaborate, and create within a Web 2.0 environment. This is the infastructure for the interpersonal relations existing in VWP design—those culturally relevant participatory interactions held by both the new teacher and the new learner. These online spaces are new and contrast the conventional Ontario K–12 educational practice, moving outside brick-and- mortar buildings to developing virtual worlds. In this space, the role of the educator is also new and is emerging more as a designer of the virtual world, a cultivator and curator of the content, and a participant in the discussions. Rather than approaching teaching from the broadcast model where one-way communication is predominant, the new teacher as the designer becomes a part of the learning process much the same as the student. As Cope and Kalantzis (2010) point out, “the new teacher will be a designer of learning environments for engaged students, rather than someone who regurgitates the textbook. Instead of being the [K–12] authoritarian, they need to be able to ‘let go’, allowing learners to take more responsibility for their own learning” (p. 204). Each communicates, collaborates, and creates within the same space together, on a journey of discovery and exploration. Learning is crafted together, and the direction of this learning is paved by the interests and discoveries of all those involved. Virtual World Pedagogy emerges from a constructionist participatory culture where students are given opportunities to actively communicate, collaborate, and create. Classpace mobilizes these values and serves the contemporary teacher by offering a working exemplar and model of a virtual world learning space designed in light of this definition of VWP. I have created Classpace as a communal, blended virtual learning space, an environment where new teachers and new learners co-exist, invent, and reform. Classpace is Web space where VWP is constructed from the working experiences and knowledge of those who participate and create in a culturally relevant learning environment. In this environment, learning matters in terms of both individual and communal knowledge construction, a place where learning is created by many as a part of a collective culture of learners.